Today is Valentine's Day - a special day set aside each year honoring love and lovers. A heart pierced by Cupid's arrow is a traditional symbol of Valentine's Day. The heart symbolizes love, and giving someone a heart symbolizes bestowing your love to that person. A heart pierced by a Cupid's arrow signifies the fragility of love and the risk that one takes of being rejected. Some also believe that the heart and arrow symbolizes the uniting of a man and woman. Centuries ago, people didn't know that the heart was what pumped blood through the body's circulatory system. However, they did know that the heart beats faster when a person is excited or upset. For this reason, it was believed that the heart was the center of our feelings. Thus, the heart become the quintessential symbol of love. In commemoration of Valentine's Day, Zorra of Kochtopf is hosting a special blogging event, A Heart for Your Valentine. She has challenged all of us to romance the special person in our lives with a homemade "edible heart". Deciding what to make was tough. Valentine's Day is all about chocolate, chocolate and more chocolate. I'm married to a man who doesn't like chocolate. Not only that, he doesn't really care much for sweets at all, so coming up with an "edible heart" that he would enjoy was a challenge all on its own. What would be the point of making a special edible Valentine for someone if they won't eat it? I still had a huge hunk of brioche dough leftover from my attempt at making doughnuts, taking up space in the fridge, so I thought I would do something with that. 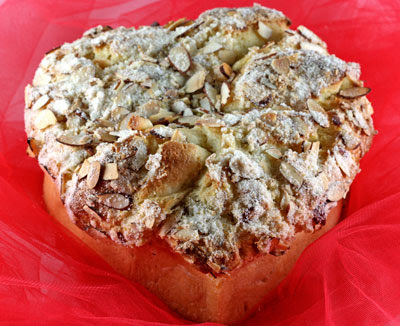 I consulted the Artisan Bread in Five Minutes a Day cookbook again and found a recipe for Almond Brioche. Mr. SGCC loves bread, and brioche is a form of bread. That sounded great to me. I have a heart-shaped cake pan insert, so I thought I would try to bake the brioche inside the heart and see what happened. Things got a little scary for a while, when the brioche was baking. The dough kept getting higher and higher, bursting out over the top of the pan. I also had to bake it about 10-15 minutes longer than the recipe specified to get it cooked all the way through. I unmolded it and, lo and behold, it looked like a heart. It worked! I had a beautiful, crusty, buttery, almondy heart-shaped brioche! And let me tell you, It. Was. Fabulous! Honestly, it was one of the most delicious things I ever baked. The brioche was soft and moist on the inside, while the sugar and almonds on the top crust had gotten all crunchy and carmelized. It reminded me of those heavenly almond croissants that I've had in Paris. Really! You must try this one. Even though it looks and tastes like it took all day, it is very easy to make and was ready in just a few hours. Needless to say, Mr. SGCC loved it when I served it with his coffee this morning. And now, he has all day to pick me up a sparkly little something to thank me! Cream together the butter, almond paste, flour, egg, orange-flower water and almond extract in a food processor until smooth. Set aside. Dust the surface of the dough with flour and cut off a cantaloupe-sized piece. Dust the piece with more flour and quickly shape it into a ball by stretching the surface around to the bottom on all four sides, rotating the ball a quarter turn as you go. Roll the dough into a 1/4 inch thick rectangle on a lightly floured surface. Use just enough flour to prevent it from sticking. Spread the almond cream evenly all over the rectangle, leaving a 1-inch border all around. Roll up the dough, jellroll-style starting at the long end, and being sure to seal the bare edges. Chill the roll in the freezer for about 15 minutes. Generously grease an 8-inch round cake pan with butter. Sprinkle the pan with a dusting of granulated sugar. **I used a heart-shaped insert, which I also greased and sugared and placed it inside of the cake pan. Cut the chilled dough into 8 equal pieces. Place them in the prepared pan with the swirled egde facing up. Let the dough rest for 1 hour. Preheat the oven at 350 degrees for 20 minutes. 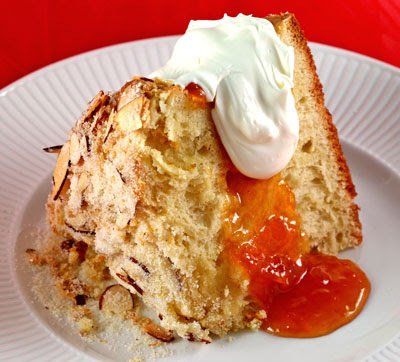 Mix the sugar, orange zest and almonds together and sprinkle over the brioche. Bake without steam until golden brown and set in the center, about 40 minutes. Run a knife around the inside of the pan to release the brioche and invert it into a serving dish. Eat warm. I'll have to remember this when I make the brioche from that book! It looks wonderful! I've never made brioche before, you're certainly tempting me to try! Your Valentine is very lucky to have had such a wonderful breakfast! I love, love, brioche. This sounds amazing! What a challenge it must be to bake for your husband. I would force him to eat whatever I made. Deborah- Trust me. I was surprised by how good it was. You need to try it! Lyb- It really is a great and easy recipe. I've used other brioche recipes before and this one was the best. Emiline- Lol! You can't force him to do anything! He is usually very appreciative when I make something he likes, though. Wow... this brioche looks amazing! I just found your blog because I saw a comment you posted on the Travelere's Lunchbox blog. I had to click on your name.. Sticky, Gooey, Creamy, Chewy... My mouth waters just by repeating it! 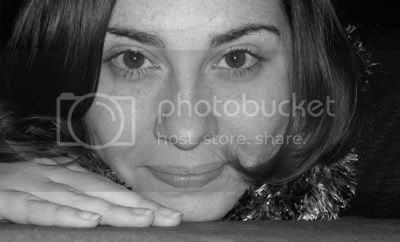 You have a lovely blog here with very beautiful photos. I just started mine and I love how many good looking blogs there are out there. Your doughnuts also look amazing (I also took part in that). So I just wanted to say Great Job and I will be reading your blog everyday! Oh, and I'm making that brioche! Oh, and I just noticed you live in Sarasota. I live in Jupiter, right across the peninsula from you! And I should be a Daring Baker for March too so I suppose I will be reading about you a lot soon! Exciting! Oh my good, this brioche looks so stunning! I will give it a try soon. Perhaps with another dough, because I wasn't quite happy with the 5-minutes-a-day-dough (normal one). Thank you for your participation. I I hope you passed a wonderful Valentine's Day, and your husband brought you a sparkly little something. I'm a sucker for almonds and to put them on brioche is just perfect! It looks so good! It does look ABSOLUTELY FABULOUS! Oh why do I not have this book yet?? That looks amazing! Aran- Thank you so much! You are very sweet. I'm so glad that you enjoy my blog. Please come back often. I came up with the name because I loooove caramels, and they are sticky, gooey, etc. It just seemed like all the best foods had those qualities. I have been to Jupiter several times. My husband and I considered moving there years ago, but I grew up here in Sarasota so we stayed here. He is from Daytona Beach. You'll enjoy the DB group. They are a great bunch! Zorra- Thank you! I'm glad you liked the brioche. You definitely must try it. With the almond filling, it is awesome! Patricia- I love almonds on everything too. I highly recommend this brioche. We enjoyed it very much. Veron- Thank you, thank you! That is high praise. I've seen your beautiful work. Brilynn- Stop torturing yourself! Get the book! I never knew brioche was so easy to make. I could give you a big hug right now, because I LOVE it! Oh, thanks, Susan! Brioche is one of those things that I'm endeavoring to try my hand at in '08. This looks AMAZING! You're now tagged for the meme! Please go to my post below for the rules and I hope you have fun! That looks so incredibly yummy! Oh my gosh....this looks incredible. I just recently bought a brioche mix for choc. chip brioche from www.kingarthurflour.com I have not made it yet but I think I may try your recipe first. My husband LOVES almonds. Got your link off of slashfood. I will be back to read more. Thanks for sharing!! The brioche looks mouth watering. A couple of things are vague though. The ingredients list calls for 1.5 lbs dough. The instructions say that this should be cut into a cantaloupe sized ball. So is the weight of the dough actually used less than 1.5lbs? Also in the intro you say you had to bake it for around 15mins more. Is the time in the instructions(40mins) inclusive of this extra 15 mins? Hi Susan, this looks yummy! I am not a huge bread eater, but I could definitely go a slice of this. And the heart shape is gorgeous. BleedingEspresso- A dove! That sounds pretty cool. 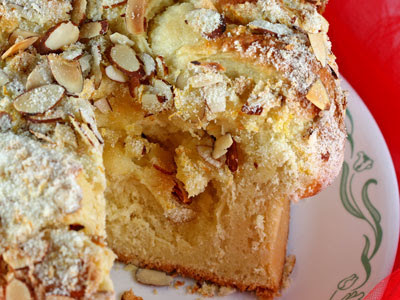 Actually, the brioche reminded me a bit of the Easter bread my mother bakes, just with almonds. Michelle- Go for it. This recipe is much easier than a traditional brioche. Having the pre-made dough cuts the time way down. Obsessive- Thanks. I'm glad you found me. Chocolate chips would be nice too. The Artisan bread cookbook also has a recipe for chocolate filled brioche. Anonymous- The master recipe for the brioche dough is supposed to make 4 one pound loaves. I think that when they say to use a cantaloupe-sized ball, they are estimating what a 1 1/2 pound ball would look like, since it might be hard for some to measure exactly. It isn't really a very scientific way to do it, but I don't think a little more or less will affect the outcome. I can't say for certain if my ball of dough was exacty 1 1/2 pounds. I had to bake mine longer because I used the heart insert and it was smaller in circumferance than a regular round cake pan. My brioche baked narrower and thus, up higher. I had to bake it longer for the center to cook through. The recipe I provided was as written in the cookbook, except for my added note. The recommended baking time is 40 minutes. I baked mine 15 minutes on top of that. If you use a regular pan, 40 minutes should be right. Sorry about the confusion! Cakelaw- Thanks! I'm glad you liked it. This was a moist and slightly sweet bread. The almond really gave it a nice flavor. It would be really good with your morning coffee or tea. I can't believe that you can make brioche look and sound so easy! Might have to try this one! I just went to a market up North of you today...Sweetwater's Sunday Market. I will post about it tomorrow so check it out. I got some fresh duck eggs that were amazing in egg drop soup!!! I got the book...I guess I should start using it! The brioche looks gorgeous. I made some saturday...must be something in the air! Judy- Thanks for the tip. I'll have to check that market out. I will stay tuned for your post. Fresh duck eggs! Wow! Tartelette- It is probably the easiest brioche you will ever make. You must try a few things from this book. I'm really loving it. Thanks so much for the clarification, Susan! You have no idea how I am dying to make this brioche. ::drool:: I am having company over next month and this brioche will definitely be on the menu. Now I need to go get this book - I've heard so many people talking about it. Your brioche looks oh-so delicious and I just love the *heart* shape! Need I say anything? Yum! I adore brioche! and this looks stunning! The dough is so easy to make and so easy to work with and delicious!!! It is now a part of my regular continental breakfast menu. I cut it into slices and leave it whole to act as a centerpiece surrounded by croissants and pan au chocolate. I made it in a tube pan rather than a heart shaped or round. It baked up very nicely. I'd like to try it in a chocolate version. I would love to send pictures, but can't figure out how! Have a Slice of Chocolate Mascarpone Cheese Pie!